Ty Buchanan is living on the peaceful grounds of St. Monica's, far away from the glamorous life he led as a rising trial lawyer for a big L.A. firm. Recovering from the death of his fiancée and a false accusation of murder, Buchanan has found his previous ambitions unrewarding. Now he prefers offering legal services to the poor and the under-represented, from his "office" at local coffee bar The Freudian Sip. A mysterious woman with a six year old daughter comes to him for help. She's being illegally evicted from a downtown transient hotel, an interest represented by his old law firm and former best friend, Al Bradshaw. Buchanan won't back down. He's going to fight for the woman's rights. Courtesy of Valerie with Hachette. I am giving away 3 copies of each book for a total of 6 winners. James Patterson is one of my faves!! I'd love to win the 8th Confession and catch up with the Murder Club! Thanks for the chance. Man the 8th Confession is the only one I need to conclude my series--for now, lol. Great contest! 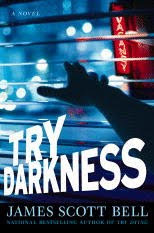 I would love to win a copy of "Try Darkness." Great giveaway. Thanks. I would love a copy of the James Patterson book. I would like to win James Patterson book. Please include me in the giveaway. I love the Women's Murder Club series. I even liked the TV show. Love to have a new book to read. Thank you. I'd love to read either of these :) Following with Google Friend Connect -- *Thanks* for the giveaway! I would love to get Try Darkness, by James Scott Bell. I'd like to be in the running for these. Please count me in. Would love to win Try Darkness. I'd love to win a copy of James Patterson's novel. I follow and would like either of these books. 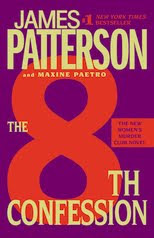 I have the 1st seven books in the Women's Murder Club series... can't wait to read this one. Patterson is my fave so I've read 8th Confession so I'd love to read Try Darkness. I love James Patterson, he is a great writer! I would love to win 8th Confession. I follow you as dtaylor98. I'm on the 7th book now and am so excited to get the the next! I would love to win a copy of 8th Confession. I own the first 7 in the series. I love the Women's Murder Club series! Please enter me. I'd love to read either/both of these books. I'm a brand new follower. Thanks for the possibility. I love James Patterson's books. Pls enter my name in giveaway. I am a follower & would love to read any of these books. Thanks for hosting! I follow via google friends. I'd love to win a good book. Thanks for the chance. I would love to be entering to win both!!! THANKS SO MUCH! !